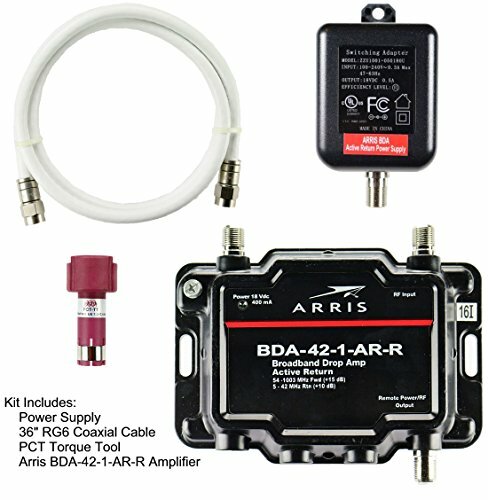 The BDA-42-1-AR-R is a bi-directional active return cable TV amplifier designed for use in homes. Boosts signal by 32x forward, 10x reverse. Active return should not be used unless Upstream Modem power level is greater than 45 dBmV. Meets all applicable IEEE surge standards for all output ports, which enhances system reliability. Weather seal and protective coating allow use of the amplifier for indoor or outdoor applications. Compatible With All Standard And Digital Cable TV Services, OTA Antenna And Satellite Services (When Using With A Satellite Received, Amplifer MUST Be Used On The Output Side Of The Receiver - NOT ON ANY LINE DIRECTLY CONNECTED TO THE DISH!